As one of the many people who unthinkingly linked on my Facebook page to the campaign for the release of ‘Amina Abdallah Araf al Omari’, a supposed lesbian Syrian dissident blogger who wrote under the title ‘A Gay Girl in Damascus’ and who was supposedly arrested by the Syrian authorities, I have been following the exposure of this hoax with a mixture of outrage and fascination tinged with embarrassment. 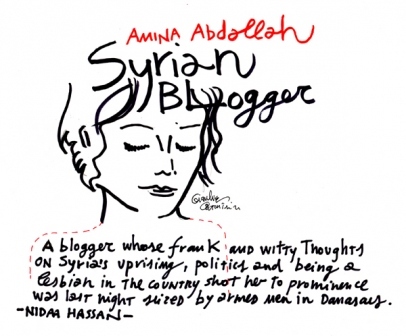 The perpetrator, a 40-year old American Master’s student at Edinburgh University called Tom MacMaster, described as a ‘Middle East activist’ by The Guardian, has humiliated and discredited those who honourably campaigned on behalf of this apparently worthy cause; put real Syrian dissidents and LGBT activists who stuck their necks out to help ‘Amina Abdallah’ at real risk; diverted attention away from real victims of the Syrian regime; and has made it much more difficult for such victims to be heard in future. It reflects an immorality of sociopathic dimensions. Not least of MacMaster’s victims is Jelena Lecic, a Croatian woman living in London and an administrator at the Royal College of Physicians. He stole photos of her from her Facebook account and passed them off as photos of the ‘Gay Girl in Damascus’. As ‘Amina Abdallah’ became a cause celebre, Lecic’s face was splashed all over websites and newspapers. This case of identity theft therefore had thousands of unwitting accomplices. One of these was The Guardian, which published two different photos of Lecic along with articles about ‘Amina Abdallah’ on 7 May and 7 June. In response to the second of these photos, Lecic phoned the Guardian at 4pm on Tuesday, 7 June to inform them that the picture was not of ‘Amina Abdallah’, but in fact of her, and demanded that the photo be taken down. The Guardian ignored this call, a subsequent call from her an hour later, and a call from her friend, demanding that the photo be removed. Lecic consequently appealed to the Press Complaints Commission, which promptly forced the Guardian to remove the photo by 6.45pm. However, the Guardian substituted it with the photo of Lecic from its earlier article. So ‘We apologise to her.’ is the sum total of the Guardian‘s apology to Lecic for colluding in her identity theft, in a paragraph otherwise devoted helpfully to directing readers to Elliot’s effort at self-justification. Note that this constitutes a – highly curt – apology for misusing her photos, but there is no apology for ignoring her calls and disbelieving her; for forcing her to turn to the Press Complaints Commission; or for then republishing a second photo of her after the latter had forced it to remove the first. As Lecic told the BBC’s Jeremy Paxman [see video above], ‘most of all, I was very upset with The Guardian, because I’ve complained, twice yesterday, and nobody got in touch with me… For me, it’s been very upsetting, and obviously it got involved my family; my friends; I’ve been disturbed at work. It’s just astonishing that just anybody can use your picture and put a story together, and before you know it, it’s everywhere.’ Readers should watch the whole video, and then see if they think the Guardian‘s apology was adequate. Also notable is Elliot’s repeated reference to Lecic, whom he describes as a ‘distraught young woman’, throughout his article by her first name. No doubt, the UK’s flagship liberal daily newspaper thinks that this familiar form of address is appropriate when referring to someone it has wronged, when that person a) works in admin; b) is a woman; and c) comes from a Balkan country. We can compare the Guardian‘s treatment of Lecic to the rather more fulsome and generous, indeed grovelling apology it made to the celebrity radical left-wing genocide denier, Noam Chomsky, five and a half years ago, also in the ‘Corrections and clarifications’ section of the newspaper, after its journalist, Emma Brockes, had been guilty of an error of detail in describing Chomsky’s views on the Srebrenica massacre. There was certainly no reference then to the complainant by his first name, or reference to him as a ‘distraught elderly man’; it was ‘Prof Chomsky’ this and ‘Prof Chomsky’ that. One use of ‘Professor Chomsky’ and thirteen of ‘Prof Chomsky’ in the space of a single apology ! By contrast, the Guardian‘s apology to Lecic used her name only once, in full, then directed its readers to a text which refers to the ‘distraught young woman’ six times by her first name. That, dear readers, is how women are treated by The Guardian – the flagship liberal newspaper in the land of the Suffragettes and Sylvia Pankhurst. Maybe if Lecic had published an article or two on ZNet denying the Srebrenica massacre, like Chomsky’s friends often do, the Guardian might have addressed her as ‘Ms Lecic’ ?